Thanks for your input. Definitely some food for thought which is just what I was hoping for. By heritage I was really thinking of re-editions by manufacturers of past lines - think Omega Seamaster ploprof. An interesting thread and it is going to be exciting to see how the collection will evolve. I was about to reply after the 2 first posts, writing that you definitely should include some vintage in the collection, but I see that you have closed that gap with post 3. 6 watches isn't much for a themed collection, unless you stick to one brand or one type of watches, so my suggestions below is based on watches that can "speak for themselves". it is not a full list but hope fully it provides a little food for thoughts. to me watches are mostly about vintage - from a time where precise time keeping was a result of craft man ship and technical solutions. Lets face it; the best time keeper I have is my iPhone loaded with an app that is connected to 4 ntp servers, which in turn are connected to atomic clocks. Further I like the idea that the watch served a real purpose; worn by a diver/pilot/soldier and used as a tool of the trade. It is a bit too easy to lead you down the military road in this category (thats where my own interest lies), but they for sure fit the bill for both vintage chronograph and divers. Vintage divers are maybe difficult to keep waterproof so it might not count for a diver in your list above. If not military, take a look at the vintage chronograps: Mathey Tissot type 20, Brietling Co-pilot, Universal Geneve Compax (Space and Nina Rindt), and the Omega Speedmaster of course. For the divers some vintage Doxa Sharkhunters, Aquastar Deepstar or anything that Cousteau wore and obviously there is the vintage Rolex path. Vintage without "tool" elements, are fast going to be dress watches and size below 38mm, which by todays standards feels small. when I hear GMT I think of Rolex - either the Master or the Explorer. But with your choice of a Bremont I wonder if it is a signal of "the desire of having high quality without flashing it"? GMT could also be a Glycine Airman, which is very tool-ish and available in both vintage and contemporary, or maybe a Bulova Accutron Astronaut with a turning fork movement. the two last are true 24 hour watches btw. I'm not sure what the heritage category covers. Is it homage, re-editions or both (or neither?). Anyway there should be room for a simple black dialed watch be in all collections; e.g. IWC XI, Omega RAF '53, Smiths, or a homage to those. Way more than six watches, but some fit into several categories and of course admiring from afar doesn't always result in a happy marriage so I m expecting that whilst I like all of the above, trying some first hand will result in a few falling by the wayside as far as my little collection goes. And of course there are the suggestions of everyone so far which also offer a number of tantalising alternative possibilities. Thanks for suggesting a dress watch. I like the idea as it adds some extra balance. And the suggested watches provide some great choices. I m just not sure I m a dress watch person!! However, one thought, and I m not sure it really fits the bill would be an Anonimo Millemetri. Not strictly dress, but dress undertones whilst still having a sporting pedigree. Maybe!! Gary, a dress watch doesn't necessarily have to be a small gold affair in my opinion. A nice large time only stainless steel watch with a white dial and blues steel hands look amazing too. Also you could have a gold chronograph on leather that looks very cool and combines 2 categories. The IWC Portuguese is beautiful in Rose Gold, but out of mu budget sadly. Something diver - so a diver... hmm... well there are many dive watches to choose from... but for me it would have to be a diver I have owned... not a Rolex, not a Bremont but and IWC Aquatimer 2000 not a flashy one just the standard version...not because it is IWC but just because it was a great watch...which IWC in their idiocy changed.... no idea why...? Of course one watch might fill several niches e.g. a vintage chronograph or a diver with a GMT function. But one way or another I want to build all of the above into my collection, which hopefully will provide a varied but balanced collection that will suit any and all occasions. I was thinking about this post only a few days ago, so it's was spooky coincidental that I chanced upon it whilst browsing this evening. Last edited by onespeed; 11-07-2017 at 20:45.
cool @onespeed let's hear it ? I have had a few years at this now and am beginning to really distill down what I think is great. Something chronograph - The EZM1 does it all for me. Tough, practical, minimalist but stylish. Luckily I have one. Something diver - as a real waterproof watch - Tudor Pelagos. Really clear, amazing lume, lovely bezel, and really no-nonsense. Nice bracelet too. Again, tick. Something vintage - Lemania HS9. Not sure I need to add anything else, but I could be persuaded to substitute a Lemania SwAF. Tick (HS9 not SwAF). Something GMT - Rolex 16710. I have recently sold a few other watches and bought a 16570. But I only did so because it seemed insanity to spend £2k more to get a rotating bezel. But I have to concede that the 16710 is better. But, either way it needs to be the 2000 transitional models. Old drilled lug case, SELs and Luminova. Stylish and practical. personally, I would chose the Coke bezel, less brash than the Pepsi, less boring than black. 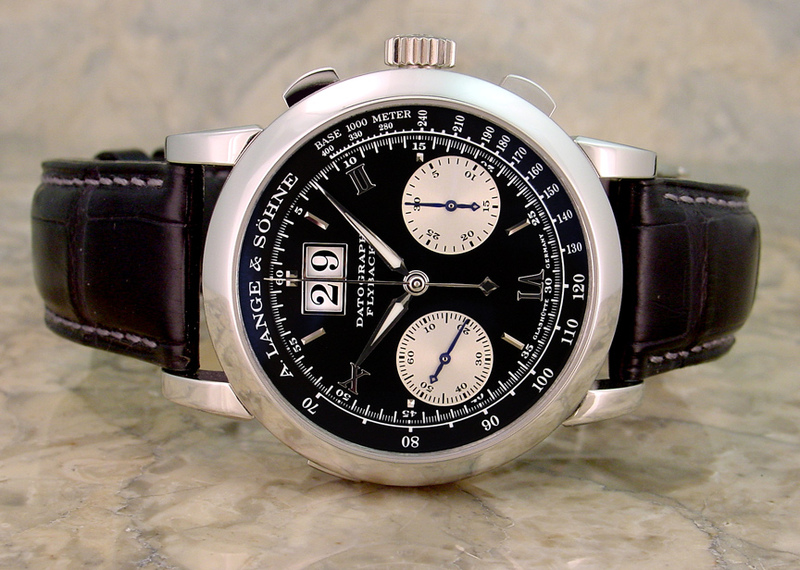 Something heritage - I would love to find a 1940s Lemania chrono, with white lume-centred sword hands and a dark dial, with the really large capped pushers they used. See the 2 chronos on the left? I want the hands and dial of the right one in the left case. Perfect. Lemania chronnos of this period ar ethe genesis of so much that we hold dear in the watch world. 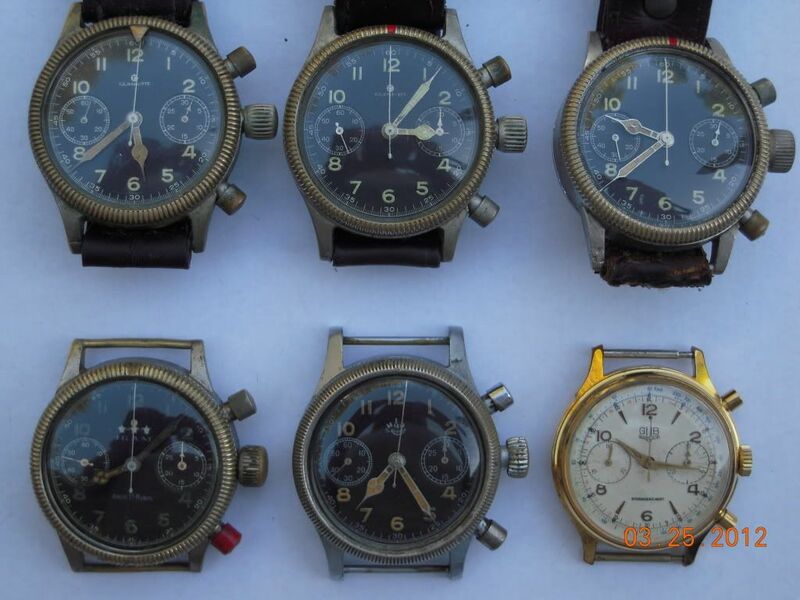 The Lemania SAAF, SwAF, Omega Moonwatch etc etc etc. That's heritage. And finally something tool. I woulld have to say My brass Armida A1 is fantastic as a no-nonsense do anyhting watch. It really is. However, I suspect that when Paolo Fanton's A13-A quartz chrono lands on my doorstep (which it will in about 5 weeks), I will take that. I suspect he is doing a great job with it. Now I have done this I realise there are others I want to include. But I will stick at this for a stab at it for now. And I count myself very lucky to have 4 of the 6.